An artist's impression of Bell Busk cotton/silk mill (late 19thC). 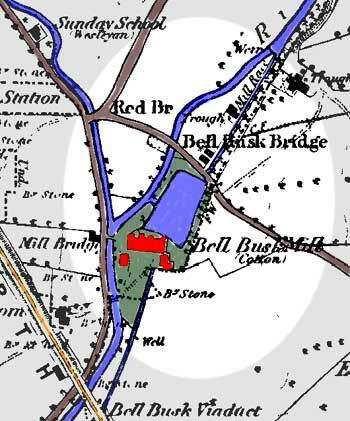 A couple of houses, an empty mill pond and a long mill race, are all that remains today of the once bustling Bell Busk mill. It is situated just outside the main Bell Busk village, with its rows of back to back mill cottages and old schoolhouse, on the road to Coniston Cold. The current village is smaller than when the mill was in use, having lost one row of the original cottages and several dwellings on the road leading up to the old station. Despite the number of cars parked in the village today, it is a much quieter place now than it was in the 19th century. Peter Garforth Junior and Thomas Hallowell had been using Carleton Old Hall as a spinning shop before they came to Bell Busk and built the Mill in 1794. I that year their new mill was insured for £1,500 and the mill work for £200. By 1797 machinery and stock to the value of £2,000 and £500 had been added, as was a warehouse and joiners shop. The main mill was five storeys high with a total of 1,965 square yards of floor space. Garforth and Hallowell ran the mill for ten years trading as Thomas Hallowell & Company, until Garforth died and at only fourteen years of age, James Braithwaite Garforth inherited his father’s share. By 1805 Hallowell had withdrawn somewhat from the partnership as he had other cotton mills at Sedburgh, Skipton and Bingley and James Braithwaite Garforth took over the running of Bell Busk Mill. By 1833 this mill was being used to spin 40s quality cotton yarn on mules. Power was supplied by a 16 hp water wheel and the small 6 hp steam engine. In 1841 James Braithwaite Garforth let the mill, he had first tried to sell of the machinery, but it remained, as the same inventory was present when the lease was relinquished in 1862. Apply to Mr John Proctor on the premises. The lease on the mill and machinery was taken by John and William Slingsby of Carleton and in April 1843, William married Mary Ann Dewhurst, daughter of Isaac Dewhurst the Skipton cotton manufacturer, and they set up home in the mill house nearby. The brothers then built another mill at Carleton, where they were born, and in 1849 John returned there to run the Carleton mill and get married himself. The census of 1851 shows William employing 25 men, 6 women, 20 boys and 21 girls at Bell Busk, the mill being managed by Thomas Whitehead of Todmorden. The Slingsby's used the mill to both spin and weave cotton, much of the thread going to their new weaving mill at Carleton. On the death of James Braithwaite Garforth in early 1852, ownership of the mill at Bell Busk passed to one of his daughters, Frances Catharine, but it was her husband, John William Tottie who negotiated the end of the lease with the Slingsbys. By 1861 the census shows William Slingsby employing 59 hands to spin cotton in Bell Busk, but in April 1862 the brothers gave up the lease on the mill and William moved with his family into their new house, Beech Hill at Carleton. Charles Rickards of Armley nr Leeds took over the Bell Busk mill, Fell & Rickards Ltd converted the mill from cotton to silk spinning, possibly due to the cotton famine of the early 1860s caused by the American Civil War. The main products made there were silk thread for hand and machine sewing; button-hole twists; and knitting, embroidery and weaving silks and claimed to offer more thread on a penny reel than any of their competitors! The 1871 census shows Charles Rickards employing a total of 80 workers (20 men, 23 women, 14 boys and 23 girls) and living in the "Mill House", and ten years later the 1881 census tells us he was then employing 30 Men 30 Women and 35 Girls. 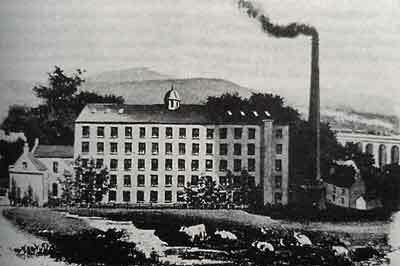 In 1892 he acquired Low Mill in Sackville Street, Skipton, which was built in 1839 by John Benson Sidgwick for weft spinning and weaving, this was also turned over to silk, Rickards ran the operation at Bell Busk whilst Fell ran the company’s other Skipton silk mill, and between the two sites they employed around 300 people. 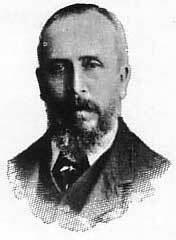 When Fell became Chairman of the Broughton Road Mill in 1897, Charles Rickards took over the whole business and ran both Bell Busk and Sackville Street mills. About this time the Bell Busk mill company joined with John Dewhurst & Sons of Skipton and around ten other major firms engaged in the production of sewing cotton, silk and linen threads, to form the English Sewing Cotton Company Limited. This was intended to maintain the mills, products and trade marks of these individual companies but eliminate any destructive competition. BELL BUSK MILLS - The industry carried on at these mills, which was taken over from Mr. C.A. Rickards some time ago by the English Sewing Cotton Company, is being transferred to and incorporated with the Low Mills, Skipton. The news has caused consternation in the village, the main portion of the inhabitants being dependant upon their employment at the mill, and it is feared that only a small portion of them can be accommodated with work at Skipton. Bell Busk mill didn't reopen, the machinery was sold and the building was left to decay and over a period of time demolished, leaving the dam, race, Mill House and other remnants seen today. The 1911 census shows that the mill employees had left and many of the cottages were empty. The mill in Sackville Street, Skipton was destroyed by fire in November 1908 and after that Charles Rickards retired and went to live near Ilkley. Bell Busk Mill, Bell Busk, near Skipton. To-morrow (Wednesday), November 25, 1908, commencing at twelve o'clock prompt. Messrs. WM. SALISBURY & HAMER, F.A.I., will SELL BY AUCTION, as above, Lancashire Steam BOILER, Mechanical Stoker, Green's Fuel Economisers, 72 in. pipes: Beam Steam Engine, Ranges of Shafting, Steam and Gas Piping, Gasmaking Plant, &c.
Catalogues may be obtained from the Auctioneers, 54, Church Street, Blackburn , and 7, Pall Mall, Manchester. Thanks to John Snoad for additional information and to George Ingle for insurance details from his book Yorkshire Cotton.